Customers who cannot afford your retainer? Customers who are too far from your geographic area? Customers who ask for cell phone or computer investigations? Customers who think someone is spying on them through computers? SEND THOSE DEAD LEADS TO US AND YOU CAN EARN $500 OR MORE EVERY MONTH. Many of our top PI partners earn $5,000 a month or more. With the massive expansion of digital devices in our lives, modern private investigators must have the ability to follow a digital trail and analyze digital “footprints.” Indeed, having such capabilities may determine how well you can serve your clients. Digital Investigation can help you successfully find, follow and document digital trails to serve your clients. Digital forensic evidence is a powerful tool for today’s private investigator, much like DNA testing for a prosecutor trying to win a murder conviction. The scientific precision and accuracy of computer forensics can help prove or disprove a criminal case as surely as a DNA match. The data found on various electronic devices, once unlocked, can answer questions with a remarkable degree of certainty. Digital artifacts from messaging, texts and social media can provide a surprising level of detail about a subject’s motivations, attitudes and activities, shining a light on covert behavior. Text messages, emails, instant messaging and images or video are often associated with metadata, which are the dates, times and other logged information relating to digital activity. By analyzing the hidden metadata on cell phones, laptops or other devices, our forensic engineers can create detailed timelines of activities and conversations. Our skilled forensic examiners also can recover data from damaged or non-functional devices and even recover intentionally deleted or hidden files, texts, instant messages or emails. We specialize in recovering digital evidence for private investigators. We can uncover the proof your clients seek, document it and brand it for you, often reducing or eliminating the need for tailing subjects or setting up time-consuming stakeouts. Digital Investigation's forensic services help private investigators prove what happened, when it happened, how it happened, and who was involved. Becoming a Partner Organization with Digital Investigation means your business can provide its clients with a full range of digital forensic services to uncover the evidence they need. The better case outcomes that result from adding forensics can improve your reputation, online and offline, and increase client referrals. When you become a Digital Investigation Partner, the new service offerings you will provide to your clients can expand the kinds of cases you can accept and resolve, which can open up your business to new customers and new revenue streams. We will create customized marketing material, detailing the digital services you can offer to prospective clients. (For our volume partners, we’ll even design a free landing page for your website). Any evidence you gather may potentially be used in civil or criminal court at a later date. That’s why extracting and documenting evidence that will stand up under cross-examination is important for you and your clients. Digital Investigation provides private investigators with a full complement of computer forensic services. Our court-admissible forensic reports are precise and thorough, documenting the evidence your clients need. Each report is compliant with FRCP rules #26 and #34, which require attorneys and their clients to understand and gather digital evidence in a timely and scientific manner. Finished reports can be custom-branded with your company logo and are structured to be persuasive in settlement negotiations and courtrooms. Our forensic investigations begin with a write-blocker, a specialized device employed so the process of making a digital image of a drive does not alter the binary code of the original device. We document the integrity of the process with SHA-1 and MD5 protocols, which generate unique “hash” codes to confirm that the data has not been altered. We are GSA contractors and have experience working with governments, national consumer brands, private investigators and leading attorneys. Our EnCase certified engineers all have years of training and have logged many hours on some of the most difficult cases imaginable. As a result, our credibility enhances your credibility. In cases where common forms of evidence are not sufficient, you can help your client to identify overlooked devices that may contain valuable data. Cell phones, laptops, tablets, servers, cloud storage, SD cards, thumb drives, even the hard drives inside copiers or GPS devices can hold valuable digital evidence. Of course, finding what you need amid mountains of data is not easy. That’s where Digital Investigation can be a game-changer. We are experts at using powerful digital sifting tools to find the needle-in-the-haystack you may be seeking. If the evidence you need is trapped in a failed or antiquated hard drive or server, and the data can’t be transferred or copied with ordinary techniques, we can help. We’ve helped governments and law enforcement with their toughest cases. 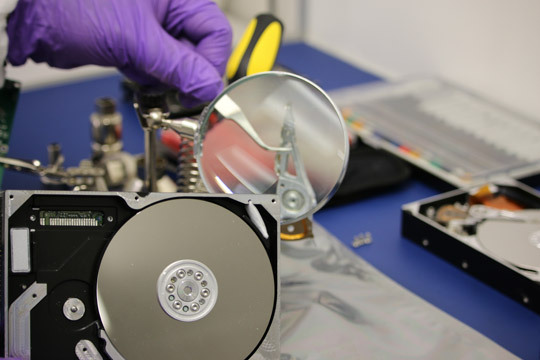 With our large inventory of rare and discontinued drives, Digital Investigation can harvest donor parts from its extensive library to rebuild nearly any broken or damaged drive and extract lost or hidden data. Using the latest innovations in specialized hardware and software, Digital Investigation can even recover missing or intentionally deleted files, as well as reconstruct pertinent metadata to develop a timeline for the associated digital activity. Become a Partner TodayOffer Digital Forensics to your clients and Earn More.